In the previous practical you wrote the driver for the display, and in labs 4-6 you will write ARM code to decode the Rugby signal. In this practical you will write Verilog to demodulate and remove noise from the Rugby MSF signal that we are transmitting via infrared, and to extract the time information that the ARM will later decode. Because the IR receivers you are using are not DC coupled, the MSF signal is pulsed with a 50% duty cycle at about 60Hz. When there are pulses the MSF carrier is present. When there are no pulses the MSF carrier is off. You must recover the Rugby signal from this 60Hz carrier before trying to decode it. where the square wave has a frequency of about 60Hz. In this practical you must flash an LED in time with the Rugby carrier. The IR beacons are on the floor in the middle of each decagonal table in the Intel Lab, with blue flashing lights. If you can't see them your demonstrators will point them out. Set Simulation mode to Functional - this is much quicker than timing simulation. For Simulation input select the .vwf file you just downloaded. Under Simulation period select End simulation at and input 20 s.
Make sure all other tickboxes are unticked. Remember to regenerate the netlist (Processing | Generate functional simulation netlist) before you start the simulation. You will need to do this every time you change the code you are simulating. When you have this working, write a short wrapper that takes your code from the previous section and links its input to one of the general purpose inputs on the I/O board, and its output to a LED or output channel. Also wire the input to another LED or output channel, so you can check the IR reception. Program the EPXA1 board, and wire up the IR receiver module on the breadboard so that it is pointed straight up: the IR signal reflects quite strongly off the ceiling. The direct-wired LED should be dimmer than the output from your module, since it is driven by a signal with a 50% duty cycle. You now need to write some more Verilog that will analyse the filtered signal returned from your module. The format of the MSF signal is described in the files on the datasheet page. It should have three outputs - the value of bit A, whether the frame represents a new minute, and a signal that will change state every time a new frame arrives. You will have to interface this module to the ARM in lab 6. Examples of all three types of signal are clearly visible in the simulation data file (this is the same as the one given above). Notice particularly the "new minute" signal about one second into the file. Notice also that the diagram above gives the un-inverted, demodulated signal whereas the simulation file gives the inverted, modulated signal like the one you will receive from the IR detector, so a high signal in the diagram corresponds to the 60Hz oscillating signal, and low in the diagram above corresponds to a high input. If you want to test your decoder in the simulator, change the End simulation at option to a longer time period: it's probably a bad idea to use the whole file (42 seconds) as the simulation would take a while. Remember to regenerate the netlist, and remember to adjust your counter to cope with the slower clock. You will also want to add your output nodes in the waveform editor, the same way as you did for the first practical. One way to decode the modulated signal is to write the code around a counter that loops every 20ms to provide a 20ms time reference. In each 20ms time frame it should determine if the signal has been mostly high, or has been low for a significant amount of time. Another way is to have a counter that counts up by some amount when the signal is high and down by some other amount when it is low, taking care that the counter does not overflow or underflow. Then output a 1 when the counter reaches its maximum and output a 0 when the counter reaches zero. When decoding the MSF signal, it is helpful to note that bit B isn't needed. 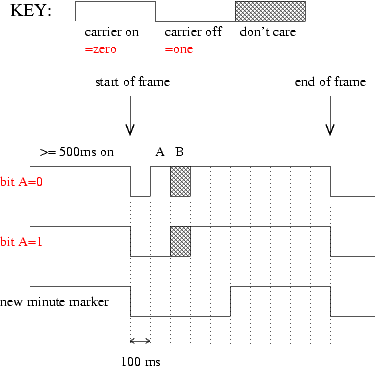 Your design should check that the carrier has been on for 500ms or more before the start of a frame. Measure the value of a signal in the middle of the period when it is valid. Don't measure it the instant it (should) change. How long does it take to receive a complete MSF sequence containing the time and date? Why is simulation preferred during the early design/debug cycle rather than testing the circuits on the FPGA? Part 1: An LED must display the current input from the IR transmitter, and the filtered signal. The filtered signal should be either fully turned on or off for no time period less than roughly 1/20 sec. Part 2: There must be indicator LEDs that show the current state of the 'A' bit, the new minute flag, and the new frame flag. The new frame flag should change state every second. Your Verilog code needs to be cleanly formatted and commented.